Due to the Puerto Rico’s gross habits, the commonwealth has amassed a total debt of over $72 billion and has already defaulted on $221 million of its’ debt. When unfunded liabilities (pensions) are included, these additional costs bring the total value of their debt closer to $165 billion, approximately $150% of its’ GDP. 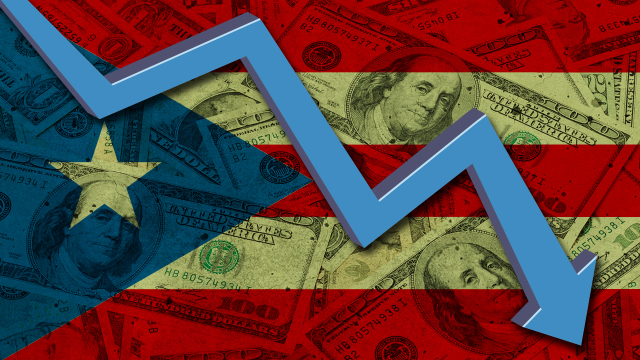 As Puerto Rico’s debt is being debated on the floors of Congress, hedge funds and conservatives are offering different solutions to this growing crisis. Hedging the Debt with more Debt? Margaret Thatcher once said “Socialism is great, until you run out of other peoples money.” Hence the problem for Puerto Rico, but not for Obama’s cronies, like Jim Millstein. The island’s plight affects most people with a mutual fund invested in the municipal bond market. Unlike the bonds of most states and municipalities, Puerto Rico’s are exempt from local, state and federal taxes everywhere in the U.S. As a result, they are held by about half of open-end muni funds. The competitive advantage made it easy for Puerto Rico to double its debt in 10 years by selling bonds to plug annual budget deficits and pay for operating expenses — the same combination that brought New York City to the brink of bankruptcy in the 1970s. Puerto Rico’s constitution guarantees that holders of general-obligation (GO) bonds are paid before any other creditors. Consequently, several funds that own Puerto Rico’s GO bonds are telling members of Congress they want to “exchange” their debt for newly issued bonds! According to the NY Post, the GO bondholders want Congress to create a “control board” to sell $6 billion in bonds backed by an existing petroleum tax. The lenders would exchange some of their debt, now trading at 60 cents, for new bonds they believe would trade at more than 80 cents, one source said. What Puerto Rico would get from the deal is a lower interest rate, around 5 percent, compared with the 8.7 percent it pays now, and a later maturity, the source said. The control board would have the right to reduce most of the 13 different classes of debt but not the GO bonds. Thanks to the highly attractive triple-tax exempt status of its bonds, it was easier for Puerto Rico to borrow and paper over deficits, rather than address financial shortcomings and economic realities in order to balance its budget. Issuing more bonds may further line the pockets of many like Mr. Millstein, but issuance is simply kicking the can down a bumpy road to inevitable default. Instead of throwing more money at Puerto Rico’s problems, the Puerto Rico Oversight, Management, and Economic Stability Act (PROMESA), was introduced by Rep. Duffy and developed by the Committee on Natural Resources and has received broad support from leading conservative groups. Why? 1) It protects American taxpayers from bailing out Puerto Rico. 2) It brings order to what will be debt-restructuring chaos if Congress does not act. 3) It gives the territory a chance to make conservative, limited government reforms. One priority the groups reiterated over and over again is that this legislation is Congress’s best tool to avoid a taxpayer bailout of Puerto Rico. “If nothing is done the situation will get worse for all stakeholders. Over the next year, Puerto Rico must make $3.5 billion in debt payments that is has no way of paying. As early as next month, 11 government entities will begin defaulting one by one. Because it is unclear which debt is first in line, the ensuing lawsuits will result in chaos. Not only will Puerto Rico lose out, but creditors will lose out because they will not be paid what they are owed. The alternative is the House bill which creates a strong oversight board to manage Puerto Rico’s fiscal crisis. The Oversight Board is clearly the better outcome – it will maximize creditor recovery because they will get little or nothing from Puerto Rico if the island has defaulted. . .
“PROMESA contains no federal bailout and does not leave taxpayers on the hook. Despite accusations that this taxpayers and savers are bailing out Puerto Rico, the legislation has zero federal budgetary impact. “House Republicans are advancing legislation that makes some progress on these issues. It would allow debts to be restructured, albeit using a convoluted process that it pretends does not amount to an extension of bankruptcy protections to the island. It would create a control board for the island, of the type that brought order to the finances of Washington, D.C., in the 1990s. And it would reduce the minimum wage within Puerto Rico. . .
“This legislation creates an essential mechanism to thwart a taxpayer bailout of Puerto Rico’s fiscal failures. . . The legislation provides reforms that will allow the territory to fulfill its debt obligations responsibly and efficiently. It will also help the citizens of Puerto Rico prosper from a growing economy. The bill is designed to address problems related solely to Puerto Rico and will not have any impact on existing bankruptcy provisions that govern states or their municipalities. “The United States finds itself in a difficult position in relation to the Puerto Rican debt crisis. Speaker Paul Ryan, House Natural Resources Committee Chairman Rob Bishop and Financial Services Subcommittee Chairman Sean Duffy have put together a thoughtful approach to protect the U.S. taxpayers by imposing a tested mechanism for getting the territory’s finances under control and by creating a controlled environment for restructuring Puerto Rico’s unsustainable $72 billion of debt that will keep taxpayers off the hook. “There is a successful history of Congress imposing financial controls in the past with the most recent example being the successful effort in the District of Columbia to pull the nation’s capital back from the brink of insolvency. Protecting taxpayers is job one of this legislation . . . any attempt to weaken the power of the imposed financial control board to restructure Puerto Rico’s $72 billion debt must be a deal breaker. “The first alternative available is to deal with many hard decisions and many necessary reforms in a controlled fashion. The second is to have an uncontrolled crisis of cascading defaults in a territory of the United States. Congress needs to choose the controlled outcome by creating a strong emergency financial control board for Puerto Rico—and to do it now. This is the oversight board provided for in the bill currently before the House Natural Resources Committee. The bill further defines a process to restructure the Puerto Rican government’s massive debts, which undoubtedly will be required. Speaker Ryan has made it crystal clear that House Republicans’ number one priority is to shield American taxpayers from a bailout of Puerto Rico. This legislation is the way to do that.